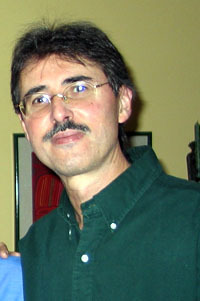 Antonio Prieto specializes in 20th and 21st century Latin American literature, with a focus on the Spanish-speaking Caribbean. He wrote his B.A. thesis on Guillermo Cabrera Infante and his doctoral dissertation on José Bianco. More recently, his interests have focused on Cuban exile literature, as well as Cuban American, and more generally, U.S. Latino literature. He has taught all levels of the Spanish curriculum, a freshman seminar on U.S. Latino Literature, and the introductory course for the Global Citizenship program. He has served the University as Director of the Latin American Studies program and is currently serving as MLL Department Chair. “José Bianco: Amistades literarias y proyecto de autonomía.” Las lecciones del maestro: Homenaje a José Bianco. Ed. Daniel Balderston. Beatriz Viterbo Editora: Buenos Aires, 2006. 29-45. “‘Where it is dónde voy’: Hibridez cultural y vicisitudes del idioma en Mi querido Rafa, de Rolando Hinojosa.” Revista Canadiense de Estudios Hispánicos 29.3 (2005): 469-90. “Cómo vivir en ningún sitio: Entrando y saliendo del exilio con Reinaldo Arenas.” Revista Hispánica Moderna 55.1 (2002): 168-87. “Idioma y ciudadanía literaria en Holy Smoke, de Guillermo Ca­brera Infante.” Revi­sta Iberoamericana 154 (1991): 257-64.